Margins: The outside margins of your pages should be a minimum of 3p (.5”) and the inside (gutter) margins should be a minimum of 4p6 (.75”). Bleeds: Bleeds should be p9 (.125”) on the top, bottom and outside edge of each page. These should be set up when you create your file. 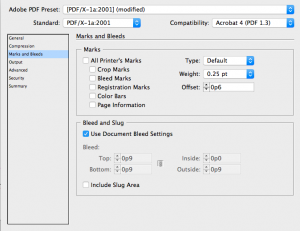 InDesign PDF File Setup: Use the PDF/X-1a:2001. Do not add crop marks, bleed marks, registration marks, color bars or page information to the file. Do check the Bleed and Slug Use Document Bleeds Settings box if your file contains bleeds. Cover Setup: Please ask your sales representative for a cover template based upon your book’s specifications.